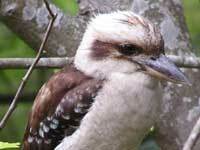 The Kookaburra is the most Australian of birds. 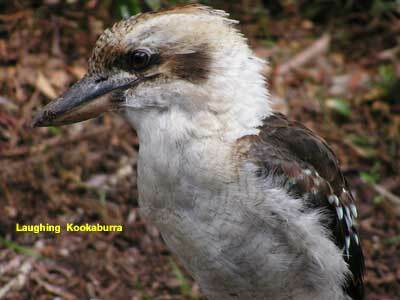 The best known member of the kingfisher family, Kookaburras can be found in all eastern states and south-eastern South Australia. 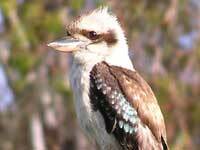 And has been "introduced" into Tasmania and south-western Western Australia. 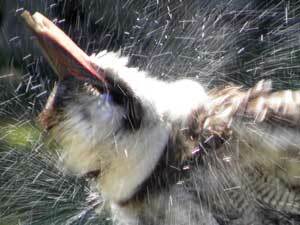 Its raucous call or laughter is very endearing to most Australians, and can be heard before dawn and at dusk. 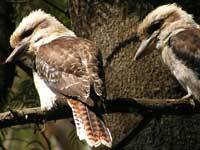 As they live in small family groups, when one starts to chortle, the others join in. 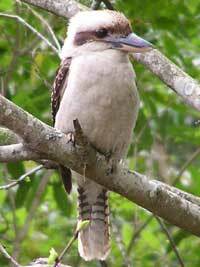 They can sometimes be seen sitting on a branch 4 or 5 metres above the ground, quietly watching for an errant lizard or small snake, and then drop without a sound grabbing their prey in their beak as they touch the ground. 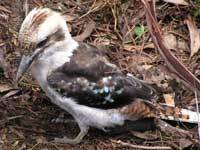 These photos were taken in Cheltenham in Sydney, Jervis Bay and in Orbost, Victoria.